I love this Budgies colors!She is very sweet,gentle,and hand tamed.I am not completely sure what type she is,that being said,Im completely in love:")If anyone can tell me what type she is,Id love to hear from you. 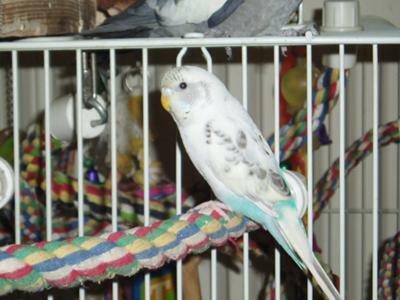 This is a beautyfull Danish pied budgie. Your budgie looks SO cute! If I get a budgie, I would want to get this kind! My boy snowflake looks almost the same, no yellow. Glad to find out what he is too, thanks ! Fancy is so beautiful! My budgie looks just like her. she is so beautiful! she pops out from the screen and shows off how stunning she is! i give her a 5! :) so gorgeous! Thank you!! :"_..it was what I guessed,but its nice to have another opinion,as I am new at this. it's a sky blue recessive pied.